This week I researched user personas on a couple sites thatgave out some really great steps on how to develop personas. 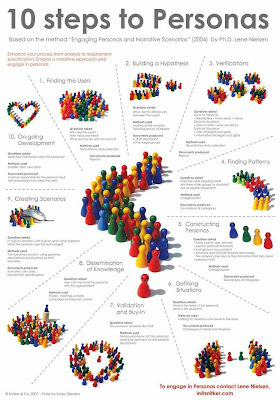 One site broke down user personas into ten steps and can be seen in the diagram below. Dr.Lene Nielson. "Ten Steps to User Persona." HCI Vistas. 2007. 2 Mar. 2009 . Is involved in the video/film industry, is web savvy, has knowledge of video production and web.